Hello there. While I’m nursing my bum knee I thought I’d share some pictures I have in my camera. I’m usually busy posting cards but I keep a list of Becca Bits that I want to publish and many of them are in progress. This is one that has been asked about frequently and now I’ve finished it up so I can tick it off my list. My Spellbinders are one of my most used tools and I have a hefty investment in them so I want to make sure they get their use. My Spellbinders storage probably looks like your Spellbinders storage, the fat CD cases make for perfect storage! But, I found that after I color coded mine – I had a solution that really, really worked for me and it has saved me time and frustration. 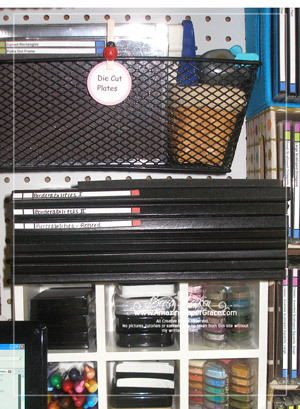 When I’m in the middle of creating, my desk becomes a mess and I could never seem to put my hands on the dies I needed – now they each have a place. 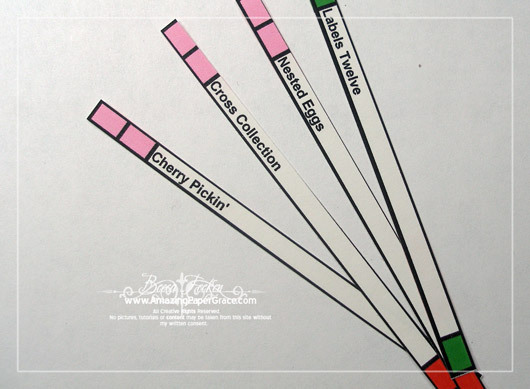 I group my dies in categories – Standard Shapes, Pendants, Labels, Flowers, Nested Shapes, etc. All of my circles are all stored together and at the top of the label I left a place for two colors – the first color is the same for all circles – the second color changes depending on if it is a smooth circle or a scalloped circle. All of my scallop shapes have a lime green label so that I can find them. If you ever decide to color code yours, tailor the colors to what works best for you. Below you can see some of the items I used and the pictures are clickable if you want to see a larger version. I keep my storage within an arms reach of where I sit because I access them frequently. Here I’ve stacked up CD holders that I purchased at Target. I also store my Borderabilities and long dies within an arms reach. Here you can see the color coding a little bit better. 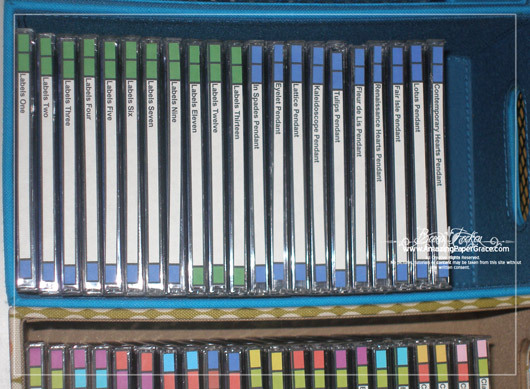 I simply make an excel spreadsheet, drop in the colors and cut the grid out so that it can be applied to the spine of the CD. These are ready to apply. 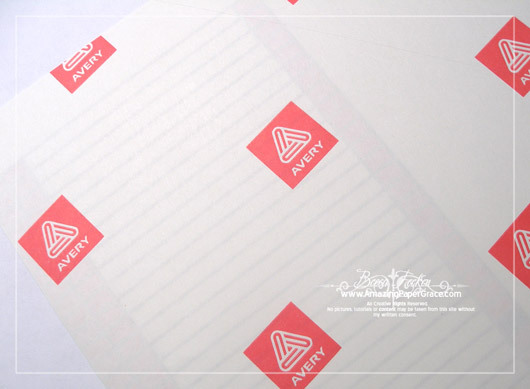 The spreadsheet is printed on an inkjet printer on Full Sheet Avery Labels (8165) before being cut out. This is what I started out with. 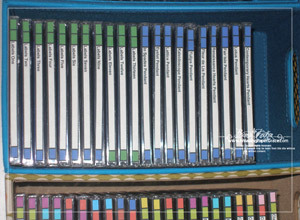 For the longer nested dies I use CD Cases – I covered them in another post HERE. I simply apply my spine label to the front of the CD Case. I store my 6″ borders in a magnetic album. This one was picked up in the scrapbooking section at Hobby Lobby. I hope this helps those of you who wanted to know :-) Don’t forget I have current blog candy that you can read about and comment to HERE. Becca, I agree with Sue! How soon can you come over & help me organize? I’d love to have you! Hope your knee gets better soon! Your system is amazing! I have a pretty good handle on my Spellbinders at the moment…all one set of them! I was a little unsure of how well they worked but after using my set, I love them! As I keep adding to them I will have to take your ideas and put them to work for me. great sotrage ideas you are the best!!! Thank you for sharing this! Right now my organization consists of piles of things. This is very helfpul! 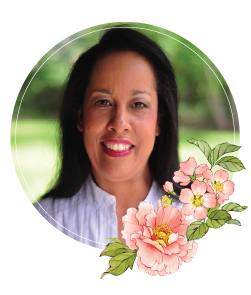 I am loving your blog Becca… I never realized the community of blogging christian crafters was so big. What a fabulous way to make great friends. Great ideas Becca. Storage and space is a big problem for me. I really do love those dies and use them a lot (tho’ nothing fancy like you do). This is weird because I had just been looking/searching for some of my dies, I knew I had them but couldn’t find the set I needed…..and then they are all jumbled up in a drawer……by themselves, but still loose in a drawer. This is perfect……thanks so much. Becca your storage ideas are as well thought out as your cards are! Thanks so much for sharing them with us. I agree with Bonnie W. – that having things close at hand makes it much easier to get your job done well. Thanks for the tips. 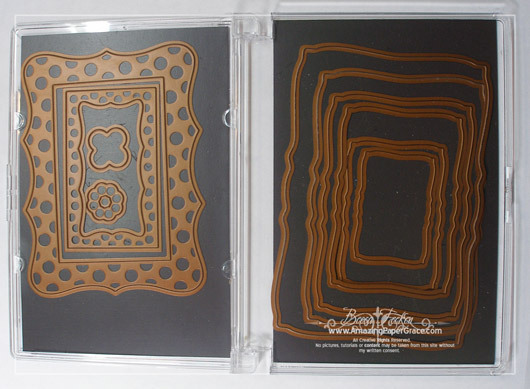 I had heard about the cd cases (not sure how to get the insert out) but I did not know about the longer ones, I appreciate the website. AND…I learned something else…i didn’t know there were borderbilities or piercibilities…WOWZA!! I love your organizational ideas Becca. Now I just wish I had the space to set up a system like yours. Great storage tip!!!! 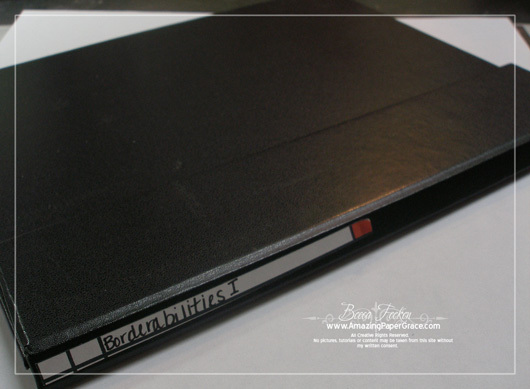 I am presently storing my Spellbinder dies on magnetic sheets and stored in 3 sizes of photo holders pages that fit in a 3″ zipper notebook…works okay, but have to be soooooo careful they don’t fall out as the notebook is really full – and heavy! 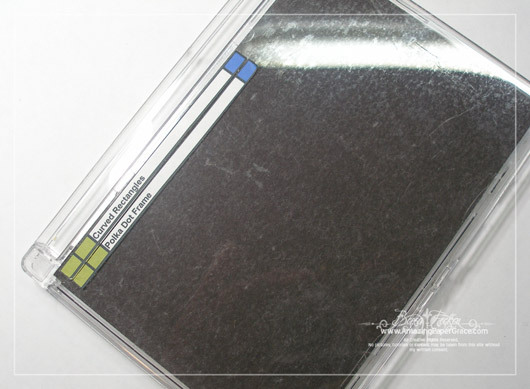 Do you use magnetic sheets inside the plastic cases for the Nestabilities dies? wauwww, it’s a wunderfull idee this looks so much better than the simple cases i store them in, this is a great way of organising. thnx for charing this with us. are the dies on magnetic sheets or just like they come in the cases?? Wish I was organized like you!! Wow!That’s alot of spellbinders! What a neat way to store your Spellbinders. Where did you buy your large magnets for the cases? Love your color coded storage idea. Is is possible that we could see your whole craft area? You have so many great ideas, I’m sure I am not the only one who would love to see your entire work area. I am SO glad you shared this with all of us…. the color coding solution is going to be a life saver. And to see how you put or the Borderabilities together is a nice idea too. 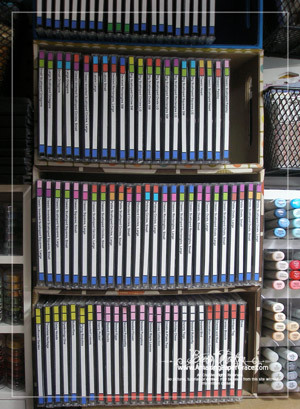 How do you store the Grand 12″ Borderabilities?? Do you have a easy solution for that, (I hope so) I have a few but there so hard to store I’m afraid I may not get anymore because they may get damaged. Great storage. I have been looking for dvd boxes like these (with removable centres) for ages with this idea in mind and could never find them. 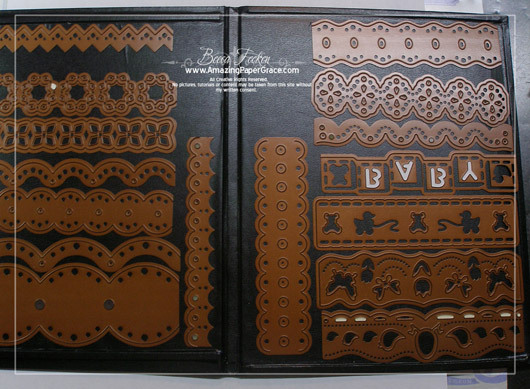 I have now discovered Stampinup do boxes like this blank for about the same price and no centres to remove, lol.